Companies everywhere are ramping up efforts to go green, but sustainability starts with your employees. They’re the ones printing the sheets of paper and drinking the soda cans that often easily end up in the trash can, without much thought. In the average workplace, about 80 to 90 percent of solid waste is actually recyclable, according to the U.S. Environmental Protection Agency (EPA). Establishing an office recycling initiative won’t just reduce your carbon footprint, but it could also save your business money. Here’s how to get started. Ready to get up close and personal with the trash can? The first step to setting up an effective recycling program is to survey your workplace, and figure out exactly what’s going into the trash. Then, you can figure out which products are recyclable and which ones you want to include in your workplace recycling initiative. The easiest way to do this is by reaching out to whoever collects your recycling, whether it’s your municipal waste management program or your building management, and asking them exactly what they recycle and what they don’t. Or a quick call to OVP Recycling at 954-572-7534 will help you to develop a blue print for your recycling program. Paper products are a typical place to start. In U.S. workplaces, one to two pounds of paper product waste is generated on average each day, according to Kent Forester, an environmental protection specialist at the EPA. Beverage containers, too, are a no-brainer; most workers go through as many as 3 a day, Forester says. 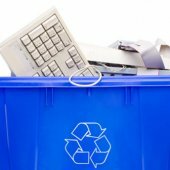 A few months after you launch your program, as employee participation and awareness increases, you can move onto other, larger recyclable objects, such as ink cartridges, computers, and other electronics. Make sure you take a careful look at the EPA standards and regulations for recycling electronics, as well as your local and state agencies. For more unusual items and a complete list of directories, check out Earth911. Whatever you decide to recycle, you’ll need to appoint a coordinator to oversee and organize the program. This person should ideally be someone who is enthusiastic about sustainability and willing to help plan and see the entire recycling initiative through. Seth Goldman, founder and TeaEO of Bethesda, Maryland-based Honest Tea, instituted a comprehensive office-wide recycling program that is part of a broader sustainability initiative at his eco-friendly beverage company. He made sure to make it as simple as possible for employees to recycle: Each employee has a recycling bin at their desk. “Of course, the recycling bin is just a little bit closer to them than the trash can,” he says. Besides handy bins, another way to encourage employees to participate is consistent communication. Make sure every worker in the office is aware of the program and its goals. Track progress in public by counting up recycled materials, and let them know what they’ve helped to accomplish so far. You might even try adding incentives or rewards. Three months after Goldman and his staff moved into a new office building in 2007, Goldman was working late one night and noticed something particularly unsettling. He saw the janitorial staff combining the separate recycled materials into one bag with all the trash. “You can do everything you can to educate employees and make it easier for them to contribute, but don’t assume the rest of the parts you can’t see are going to do it the right way too,” he says. It’s essential to reach out to your building management or your landlord to notify them of your recycling initiative, so they can make sure janitorial staff is on the same page. Your office complex might even already have a recycling program in place, making it easy to take advantage of what’s already available. The potential for a successful recycling program balances on the employees who are producing office waste. You need an ongoing education program that lets them know the details of your program, and what they can and can’t recycle. One of the most important parts of the process is deciding how to collect and dispose of the recyclables. There are many different types of paper products, like printer paper, magazines, cardboard, and construction paper. You can separate each specific type, which can be make your recyclables more valuable if you’re disposing of them at a drop-off center and could increase employee awareness about the specifics of recycling. You could also collect all paper products in one bin, and plastics in another, in a method called commingled collection, according to Earth 911. This is less work, but the materials could be contaminated easily when they are mingled together. Many businesses are located in municipalities with recycling services, or are located in office complexes where the management is responsible for waste disposal. Contact whoever takes care of your waste to arrange for proper disposal and pickup of whatever materials you recycle, too. You may have to hire an outside service. This will depend on the size of your company, as many commercial recyclers require a particular volume of waste that could be more than your company generates. Consider partnering with other companies, hiring smaller companies, or arranging to drop off recycling at drop-off centers. Another viable option is donating to charities. Many local organizations will offer to come pick up recycled materials, particularly electronics. Give OVP a call or contact via our contact us page and we will be happy to pick up from your office. It’s another way to encourage employees by creating a sense of good will. Recycling programs are often only a smaller part of a broader workplace program to encourage sustainable business practices. Especially if you’re looking to save on costs, combining your recycling program with an effort to reduce office waste and reuse existing products can be a smart business strategy. When you’re auditing what goes into the garbage, you might realize that you’re wasting a lot of paper. Try to find tasks that could be paperless, or products that could be reused. Recycling, reducing, and reusing doesn’t have to stop in the workplace. Goldman reached out to his community by organizing biannual electronics recycling days in a program called Bethesda Green. “Adding an extra dimension to the program definitely increases the overall awareness,” Goldman says.